It’s been a while since I’ve mentioned our four-legged friends around here, and some of you might be wondering what’s going on. Well the puppies have all been adopted out–the last one the day after Christmas. Sniff sniff. I definitely miss their energy but not so much the crazy hours and, ahem, the smell. From about that time, I’ve been working hard on the blog and trying to juggle other work projects so other than our 5 walks a day, Luna and Stella have had to entertain themselves. Poverine, I know. And they’ve had plenty to play with as well, including these adorable squeaky snowmen. Indeed, this was a common scene around here over the past couple weeks. But the snowmen have since surrendered. Man-oh-man, I’m jealous of those sherpa jackets. I’ve always liked the looks of them, but never had one. Truly, you have two lucky dogs there! Ally, I’m jealous too! I’ve always wanted one and now I have to covet my doggies’ jackets! Congratulations on the new webspace! Moving to a bigger place is fun. Rachel, it’s been *very* fun playing with everything. And yes, these pooches are definitely spoiled…at least by their Nana. Giulia, I hear ya! I *wish* my mom had sent me a matching one 😉 And yes, those snowmen have definitely seen better days. haha, those are some stylin’ dogs. Hey, don’t give them any thoughts about boy dogs! We’re trying to avoid more puppies you know! Karina, sounds like P and his rules about dog accessories like harnesses–ALL black. Boo! Warm and stylish indeed! I’m glad the snowmen surrendered, it looks like they’re definitely on their last gasp. Jen, the snowmen really put up a great fight. And then Stella ripped off one of their hands and took it outside to bury it. Don’t tell the girls that please! I was just thinking about your puppies recently. Whoa. Inline comment replies. What happened to the technical ingenue that couldn’t get AdWords set up? Complimenti! *LOVE* the new styles for the girls… are they posh or what? Perfect for a cool walk out with you in the Italian countryside. Loving the new site, it’s very comfy and cozy here, I am all curled up in a corner with my earl grey and your posts and puppies. Ciao bella! So happy to see you here and I’m glad you’re curling up. I just think everything is much easier to find although I understand some people’s reluctance to change from the old look. I can smell that Earl Grey…. Oh, how cuuuuute!! I know the feeling with those toys not lasting very long. Problem is, she is only 1 dog…and she does 2 dogs worth of damage 😉 I am glad to hear you found homes for all of them. Hah! Truth be told, Stella does all the damage on this. 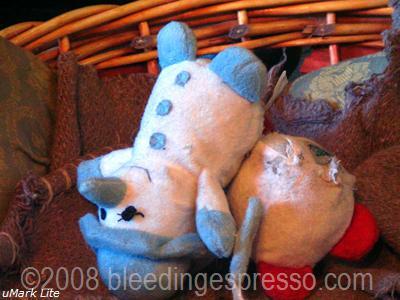 Luna plays but she’s not destructive–Stella recently chewed up a hollow rubber ball coated like a tennis ball. Don’t even know how she managed it, but she’s got some teeth obviously! Congrats and I am glad you had a happy holiday. Well, Dear…I must apologize for my extended absence…as I can see that the place has obviously gone to the dogs! 🙂 Seriously, I love the new look…the much easier method of getting my two beans in…and most importantly, the fact, that I have not been issued a lifetime ban for single-handedly screwing up our much anticipated reunion last Spring. 🙁 Please know that was, without any doubt, my biggest failure to date. So, at least I set some kind of personal record in the pathetic process. And, I am determined to redeem myself…I promise! Anyway, who cares about that? It’s not like we are reading BleedingDumbAsso.com! So, may I ask…with all of this rich and interesting content…are there any plans to harvest just 10-15% of the ripest beans…to pen your first best-seller? Hmmm…Hmmm…Hmmm? Luna & Stella looks like two real hams with their jackets on. I am glad to hear that all of the puppies have found homes. 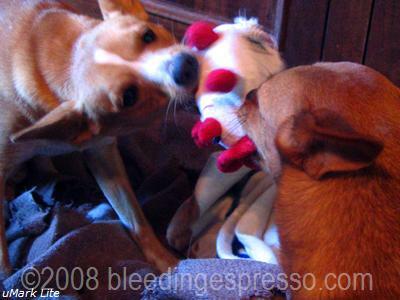 Love hearing about the dogs and seeing how cute they are – nifty little sherpa coverings they got there! But I really have to tell you this – the new blogsite loads immeasurably faster than the old one did – including the comments -which set up immediately for me! Almost as fast as those detectives on “Law & Order” can key something into a computer on the show and faster than the speed of light, an answer immediately pops up on the screen! Good job, young lady! I, for one, really appreciate what you’ve done – not just aesthetically but to improve reception of your blog on my little old computer too! What cute pupsters! 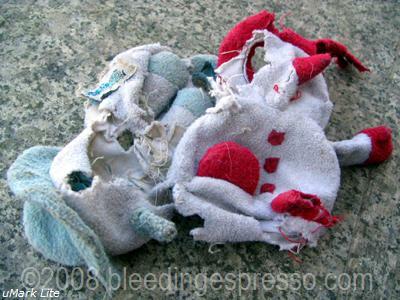 The toys remind me of my dog Charlie’s favorites–completely obliterated. I just found your site and wondered if you are still an expat? I just moved to Europe (German wine region) and am wondering how you enjoyed your experience? I’ll look forward to reading your meme! I thought they looked alike, too! That is too funny. I thought I remembered a certain photo “Me Not me” post where you didnt like dogs in clothes! 🙂 Personally, I think they are precious…a little scary, sometimes, but cute. You know what is REALLY scary? I got a Christmas card when I was still in Texas, opened it up, and who was smiling back at me, but my aunt’s dog, Tiger..sitting on Santa’s lap! lol It was adorable! I believe that dog-in-clothes photo was sporting a particularly frou-frou outfit; sherpas are just *cool* 😉 But don’t think you’ll be getting any holiday photos of the girls with Babbo Natale. At least I don’t *think* so…. Wow they killed those snowmen fast. Wow. I wish the literal puppies well in their new homes. Congratulations on a job well done. Cuteness is definitely a priority. Glad to see we’re succeeding. And thank you. 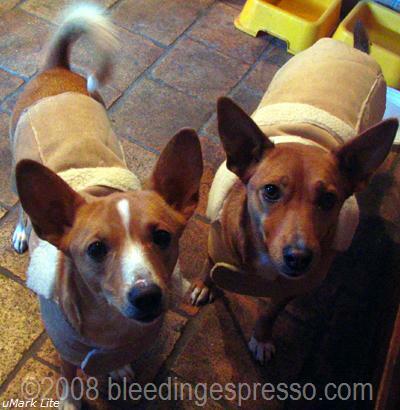 Hey, I think they look better in their sherpa jackets than I do! No fair.